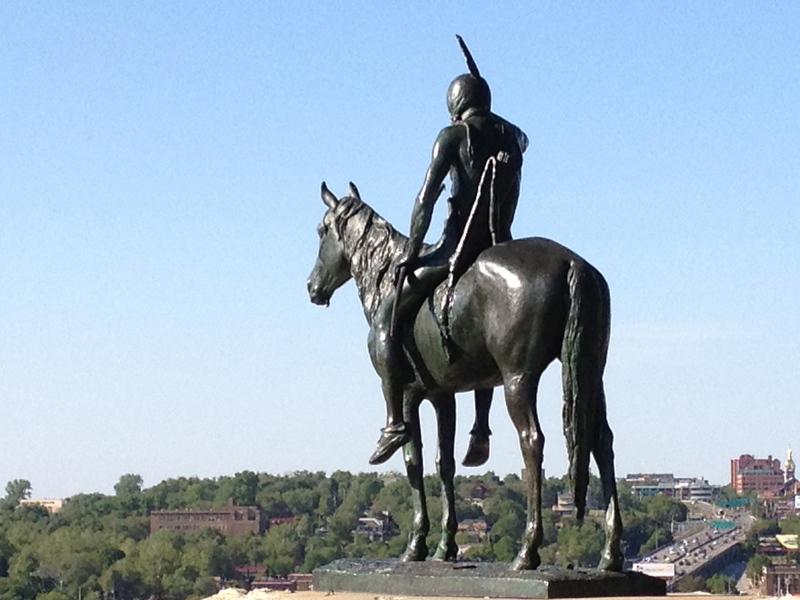 Kansas City’s most famous outdoor sculpture, The Scout, stands high in the hills of Penn Valley Park. Created by Cyrus E. Dallin, it won a gold medal at the 1915 Panama-Pacific International Exposition in San Francisco. Purchased by the “Kids of Kansas City” it was dedicated in 1922 as a permanent memorial to local Native American tribes. I am fortunate to drive by it every work day as I make my way, with thousands of others, along Southwest Trafficway toward downtown Kansas City. The Scout’s image is on local advertisements, and it inspired the name of an investment fund and a sports team. Equally magnificent, if not as well-known, is the statute of Massasoit, (Ousamequin) Great Sachem of the Wampanoag, identified as a “friend of pilgrams”, created by Cyrus Dallin and donated to the community by Mr. & Mrs. Miller Nichols. It stands at 47th & Main, on the East edge of the Country Club Plaza. 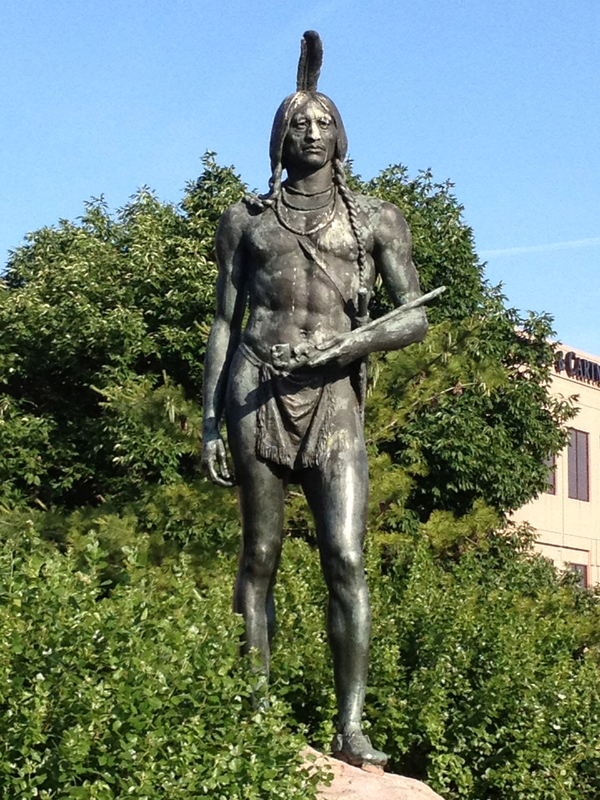 Massasoit protected the Pilgram’s from starvation in 1621, shortly after the founding of Plymouth Plantation. He also negotiated a peace treaty between an affiliation of tribal leaders and the English settlers, which continued throughout his lifetime. Unfortunately after his death in 1662, peace did not continue. Four of his five children died in “King Philip’s War” fought from 1675-8 between the English colonists and local Native American tribes. 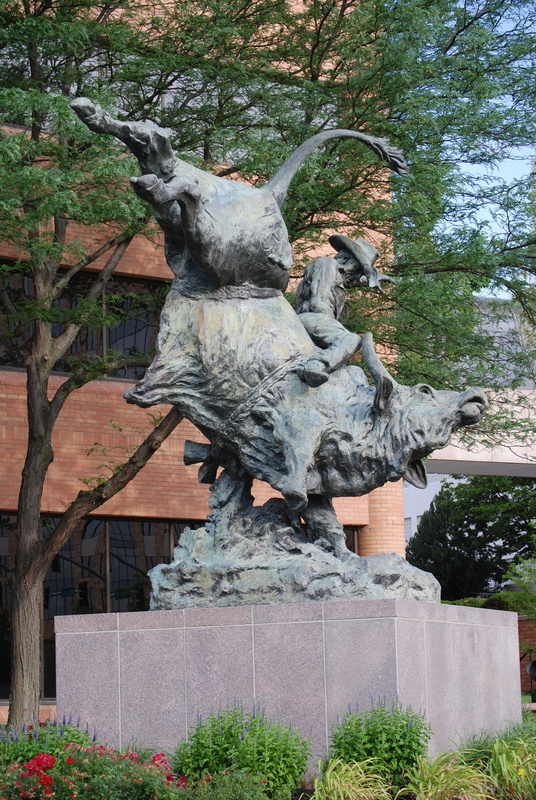 Robert Macifie Scriver is the sculptor of this powerful image of a cowboy astride a massive bull. Aptly titled “An Honest Try”, it is inevitable that the bull will win this contest between man and beast. But it is a wonderful depiction of what we often call the “wild west”. Easy to miss in a tour of Kansas City art treasures, it is located on Main Street, at the New Board of Trade Building on the South East edge of the Plaza. This entry was posted in Kansas City and tagged "An Honest Try", Art, Board of Trade Building, Country Club Plaza, Cyrus E. Dallin, frontier, King George War, Massasoit, Miller Nichols, Penn Valley Park, Photography, Robert Macifie Scriver, sculptures, statues, Wild West. Bookmark the permalink. It is always great to get a supportive comment from you. I have noticed a definite increase in views from the Netherlands in the last couple of days. Could that be your influence? Give Sophia, her parents and grandparents lots of love while you Re there. Oh, and bring back great photos of Amsterdam for the blog.